My name is Ben Hallert, and I've decided to build an airplane. 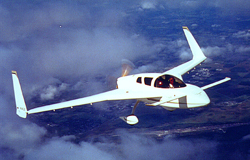 After a lot of research, I've chosen the Cozy Mk IV, a four seat variant of the Long-EZ designed by Burt Rutan (designer of the first private manned spacecraft). The FAA requires an experimental aircraft builder to keep a builders log to prove that they built the plane. This webpage will be that log, as well as a way to show my friends how I'm progressing. 4/23/06 - Like sands through the hourglass.... finally did my first big glass layup. The seat back bulkhead is curing, we'll see how badly I messed it up in the morning. I've insulated my garage door and put a heater out there, it seems to be doing ok at keeping the temp up in the curing area. We'll see what happens, I'll add more details later. 3/19/06 - With the kids asleep, managed to finish microing the seatback. Oh yeah, this baby will be flying in no time. 3/11/06 - Continued work on front seat, spent an hour on it. During that hour, I cut out a corner that I messed up on 3/7 and micro'd some replacement foam into it. Once that cures, I'll be able to contour it into good shape. Gotta love composite construction! After that, I started micro'ing the surface in preparation for putting down my first layers of glass. I didn't have enough time/confidence to do that today, but I'll get to it soon. I got the surface maybe 75% covered before I had to stop. If I had just mixed one bi batch and done it in one or two shots, I'd be done, but I underestimated the amount of micro that the foam surface would eat, so I kept mixing one or two ounce batches. I'm an idjut! A note for the future, I can probably mix bigger batches of micro since I'm using the slow hardener. Glargh! Well, at least I'm building. At this rate, I should be just about ready to fly for the 100th anniversary of the first Cozy test flight. 3/7/2006 - Life is starting to get back to normal, or at least as normal as can be. It's been a month since I got my supplies, it's time to start building! Today, I cut out the front seat! I cut and smoothed one edge as shown in the plans, but managed to really pooch it up by making it kinda rough. I don't know how hard it will be to fix, probably something I can fix with dry micro. During one cut, I broke off a corner (I epoxied it back, no harm, it's setting now). An inauspicious start, but... it's a start! - 1 hour. 3/2/2006 - Crikey, now my wife's grandmother has died. 2/12/2006 - My wife's parents were killed in a fire, the project is on hold. Much more important things to worry about right now. 2/7/2006 - Got my first shipment of supplies! Plans, epoxy, hardener, ratio pump, etc. 1/31/2006 - Finally received my serial number and word that the materials are shipping. I am the proud owner of Cozy MK IV plans serial #1432, which is funny, as that used to be the combination to get in at Santa Monica Airport when I received my pilots certificate. - The materials for Chapter 4 of the plans $460. 1/22/2006 - Making the first order this week for plans and materials for Chapters 1-4, plus an epoxy pump. Added Panel Ideas page. 1/8/2006 - Received information packet. It's official, I've spent money on it. Am I a builder yet? The decision process - How I came to choose the Cozy. Which engine to use - What's going to burn off all that extra gasoline I buy? Variations from plans - What will I do/have I done differently from the plans, and why? Misc notes & data - Stuff that doesn't go anywhere else. Running cost tally - How much have I spent so far, and where? Paint schemes - It can't fly unless it looks pretty, right? Brian Deford's Blonde Streak - One of the many great Cozy's out there, along with a great build writeup. The Cozy Girrrls - Home of some exciting modifications, including the Cozy Girrrl's strakes that I'll be doing. The Canard Zone - Great forum for getting data and advice from other builders. I'm there as 'Chairboy'. Blue Mountain Avionics - I'll be watching these guys during the build for sure, some very exciting avionics. Aircraft Spruce - The place I'll be getting my plans and building materials from. They are now the official owners of the design. Atkins Rotary - An engine vendor that specializes in aircraft conversions of 13Bs. Barnstormers - Aircraft classifieds. Might be a place to get inexpensive gauges for basic VFR until I can get the money for that IFR panel together. All text and original photographs copyright Ben Hallert except where otherwise noted. Cozy Mk IV is a registered design of Aircraft Spruce and the author makes no claim otherwise.